So far this year, we’ve had events in Nantwich, Cheshire, our annual Feaste, Basing House, Hampshire and Walesby, Nottinghamshire. 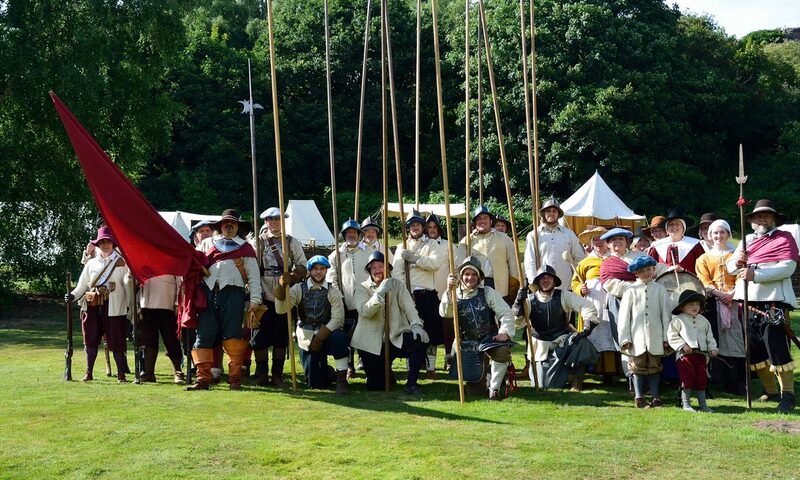 We’ll be filling you in about those in due course but our season really got underway a couple of weeks ago when a good proportion of the regiment headed to Ashton Court Estate, Bristol for our first Major Muster of the year. A couple of days before the bank holiday weekend, the weather took a turn for the worst but by Friday afternoon the sun was (mainly) shining and we were able to arrive without too many weather-related issues and get pitched up. The camping was a bit squishy but overall, it was a good site and we were located in fairly close proximity to the beer tent which is always a bonus. Some of the members headed to the local pubs whilst others enjoyed an evening in the beer tent. No one partied too hard on night one, so overall the Friday was a relaxed affair catching up with friends we hadn’t seen for a while. Saturday dawned to some iffy weather but it mostly held out and we enjoyed a relaxing day. Some people headed off to explore the pubs of central Bristol which was fun but the rest stayed on camp, chatting, relaxing and generally enjoying a bit of downtime with friends. Those who’d headed to Bristol headed back to camp in the afternoon and as day turned into night a group of us headed to the beer tent for a dance and enjoyed a really fun night. At around half past 11, we were stood outside the beer tent and watched a thunderstorm heading up the Bristol channel and lighting up the night’s sky. Luckily it avoided our site, south West of the city and most of our regiment (apart from 1 wimp!) enjoyed the light show as the disco came to the end. We headed back to the awning of some of our members continued the night’s revelry and enjoyed chatting, passing around bottles of port and whisky and general hilarity. It was really nice to be back doing this again after such a long winter. Sunday dawned and I’d love to say it dawned bright and early, but that unfortunately was not the case. Although we’d avoided the storm and just been able to enjoy the light show overnight, we had not been so lucky Sunday morning. As the heavens opened and the thunder rolled across right above the campsite, we hid as best we could from the downpour and hoped it would pass over. Luckily it did and although it hadn’t done a thing to clear the muggy air, the rain stopped and the ground held up and we were able to get back on with things. The regiment went out for drill, to ensure everyone knew what they were doing and got back into the swing of things after approximately 6 months since a large battle. After a bite to eat and as the sun came out and the temperature climbed, we took to the field and boy, it was hot, hot, hot out there! The battle was good though and we fought hard and fairly effectively. There was definitely some room for improvement, but we blew the cobwebs away for sure and came back happy, tired and hot! After a regimental meeting in the evening to discuss all the happenings of the winter and the plans for the summer, we grabbed some dinner before heading for night two in the beer tent. It was a little quieter in there on Sunday evening so we decided to head back to camp a little earlier for more singing and chatting in the awning. It was a lot of fun and another great evening together with friends who feel more like family. Truly great. Monday morning dawned and luckily, without the thunder storm of the previous day. We headed off for drill again and got to improving the areas we’d seen not going so well on the field on Sunday. Although it can seem a bit repetitive and annoying to do, we’re trying to actively improve our drill as a regiment, it’s important to always strive for improvement and keep working together well, battles are a ‘team sport’ so to say! Again, after a short break for lunch and to look around Traders Row one last time (and make our purses/wallets cry again…) 1:30 was upon us and we formed up to march to the battlefield. The crowds were considerably bigger today, even though it wasn’t as sunny or warm, but the troops were thankful for that! Yesterday we’d had to wait quite a bit until we marched onto the field but this time we were on there before we knew it, marching towards the defences that had been built to represent the walls of Bristol. The fighting was hard and at times we found there were more Royalist pike blocks than Parliamentarian ones to fight, but we got some good pike pushes in and our musket held their own against the cavalry and enjoyed some good hand to hand scraps as well as firing. It wouldn’t have been possible though without our 4 excellent water carriers who kept us hydrated and cool on a hard second day’s fight. Craig, Charlotte, Steve and Linda, thank you for keeping us in tip-top hydration condition (and plying us with sweeties!). We also need to mention Linda for another reason. At our Regimental meeting it was announced that Linda was being promoted for all her hard work she does for the regiment, largely behind the scenes. If you come and join us at any point this summer, it will be Linda who’ll ensure you have a full kit of 17th Century clothing to borrow for the weekend. She does this for every single person who doesn’t have kit of their own, including all our Newcastle’s babies and children and makes sure that it all comes home, is sorted, washed and cleaned ready for the next event. As well as this she makes the lion’s share of our clothing, making all the Whitecoats and often making linen wear such as shirts, shifts, headcloths, coifs, aprons and much, much more. If that wasn’t enough, she’s also a crucial part of our Living History team, being fully involved as a member of our crew of Ladies who cook a huge spread of food for the whole regiment to enjoy at all of our Living History events such as Helmsley and Kenilworth. So thank you Linda, for all that you do for us and congratulations on your Promotion to Sergeant, even if you didn’t realise it was you who’d been promoted for the first couple of minutes! After a great couple of battles and a wonderful weekend with friends, the majority of the regiment packed up and headed back home on Monday evening leaving a select few who made the most of the extra night’s camping and headed home the following morning. All in all, it was a great weekend and we’re looking forward to doing it all again at Newark in a few weeks time, where our next larger event will be. Before that though, you’ll find us back at Pontefract Racecourse again for the second year in a row, taking part in Wakefield Armed Forces Day, we’ll have all the info on here next week but keep your diary clear for Saturday 16th June and come along to what will be a great event and come by our camp to say hi! If you’re not able to make our event at the Armed Forces Day, but are still super keen to get involved, head to our Joining Us page to find out exactly how to get involved, we’d love to welcome you to the Flock this year. Photos courtesy of Steve Liddle, unless stated.